Lamb Growth Rate - The faster the lambs grow, the earlier they can be marketed at better prices, freeing production resources for a higher relative number of breeding ewes. The early marketability of lambs is therefore the key to higher ewe numbers, more lambs to market and higher profitability. Stocking Density - Maximise turnoff per hectare by carrying the optimum number of ewes for your particular situation. The correct balance needs to be found between ewe productivity and stocking density. Maximising return per hectare does not equate to maximising return per ewe. 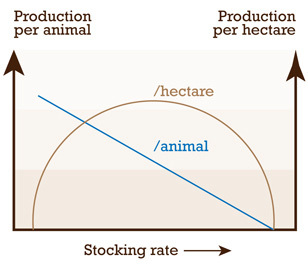 Figure 1. illustrates how stocking density influences productivity per animal. Stocking density must be set a level which will maximise return per hectare from ewes capable of efficient production at that level. Production per hectare is maximised by an increased number of ewes at a feed level that optimises production per unit of feed. At this level ewes face competition for feed. To achieve this level of production ewes must be genetically adapted to these conditions - which relates to the crucial importance of the next aspect. Type of Sheep - Ewes must be hardy, easy-care and efficient converters of even low quality feed. They must be non-selective grazers. They must have high reproduction rates, good maternal ability for high lamb survival and good milking ability for high lamb growth. Plain bodies and the optimum relationship between wool production and body size (WPP%) are essential attributes of the type of sheep capable of this level of production under hard commercial conditions. High wool production potential impedes reproduction and growth rate. Fine wool of the highest possible quality will enhance returns. Management planning - Plan lambing time in relation to maximum fodder flow, wean early and consider Feedlotting or marketing to Finishers. Good hygiene and animal health management is important to consolidate success. They were developed in a region of severe environmental and nutritional constraints (The sour grassland of the Eastern Cape in South Africa). Commercial objectives were set at the outset and selection, particularly during the initial phase, was done under very severe nutritional and environmental stress, laying the foundation for its inherent hardiness, adaptability and superior productivity. The application of performance and pedigree recording from the outset and the practical use of these records to select the most efficient animals has enhanced the rate of progress towards more efficient sheep. For generations Dohnes have been selected for high reproduction rates and lamb growth rates in this harsh environment. Consequently, they are non- selective grazers and efficient converters of low quality feed. Because of their inherent efficiency and non-selective grazing habits, Dohnes utilise a wider range of herbage and can be run at higher stocking rates. Efficient conversion of low quality feed means that spectacular growth rates are achieved in good conditions with high quality feed - resulting in the phenomenal performance experienced in good environments and feedlots. Plain Bodies and Easy-care features reduce management and input costs. Vigorous rams can be joined at 1% and less. Excellent conformation, muscleling and fat distribution mean that prime lambs fully meet the highest market specifications. An optimum relationship between Wool Production and Body Size (WPP% = 6%) facilitates high reproduction and growth rates. This does not mean that less wool is produced. Because sheep are thriving, and higher stocking densities are possible, very often more wool is produced from a given enterprise. Dohnes produce high quality Merino wool. Selection over generations for high quality fine wool and resistance to fleece rot and body strike means that maximum value is achieved from the wool component of the enterprise. * Financial data in respect of the 2003 results, upon which this document is based, was supplied by Andre Fourie of Anker Agric Consultants, Bredasdorp, South Africa.